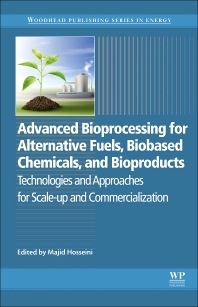 Advanced Bioprocessing for Alternative Fuels, Bio-based Chemicals, and Bioproducts: Technologies and Approaches for Scale-Up and Commercialization demonstrates novel systems that apply advanced bioprocessing technologies to produce biofuels, bio-based chemicals, and value-added bioproducts from renewable sources. The book presents the use of novel oleaginous microorganisms and utilization strategies for applications of advanced bioprocessing technology in biofuels production and thoroughly depicts the technological breakthroughs of value added bioproducts. It also aides in the design, evaluation and production of biofuels by describing metabolic engineering and genetic manipulation of biofuels feedstocks. Users will find a thorough overview of the most recent discoveries in biofuels research and the inherent challenges associated with scale up. Emphasis is placed on technological milestones and breakthroughs in applications of new bioprocessing technologies for biofuels production. Its essential information can be used to understand how to incorporate advanced bioprocessing technologies into the scaling up of laboratory technologies to industrial applications while complying with biofuels policies and regulations.